I didn’t even have to think about it. I wanted to be a musician. Specifically a guitar player. I don’t know what it was, but I was drawn to the guitar as soon as I can remember. My mom tells me that when I was very little, I would pick up any object that vaguely resembled a guitar (broom, snow shovel), and pretend to play it. 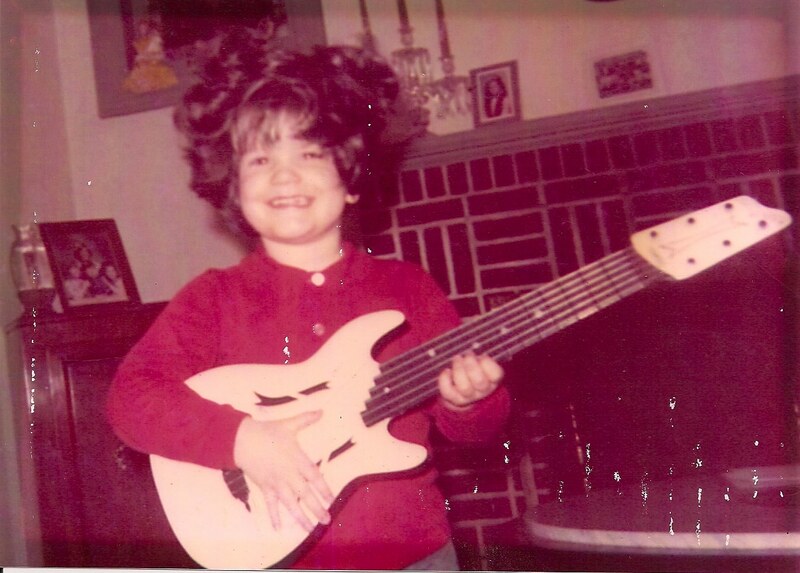 I have a picture of myself as a very young kid, maybe four, holding a plastic toy guitar and wearing one of my mom’s wigs. I have no memory of this, but here it is in full faded color. It’s hard to argue with that kind of evidence. I didn’t get my first guitar until I was in seventh grade. My oldest sister had been playing for years, and I was insanely jealous. I used to sneak into her room, when she wasn’t home, to noodle around on it. I didn’t know what I was doing, but just holding it was magical. I was a terrible student and was constantly failing most of my subjects. My parents wanted me to focus on schoolwork and not be distracted by things like guitars, so they wouldn’t get me one. But that turned out to be a blessing. That’s where drive comes in. If you have a passion for something, you find a way. Sometimes, if you’re lucky, that way just presents itself out of nowhere. One day, I was walking with my buddy Steve, when we passed by a church rummage sale. There, on one of the tables, was a guitar. It was dusty and missing strings, but I didn’t care. To me, it was a glorious thing. “How much for the guitar?” I tried to act casual. “Five dollars”, the lady replied. I guess my face must have fallen. I didn’t have anywhere near five dollars. She smiled at me and kind of looked around conspiratorially. “Come back after 3:00”, she told me. At 3:05 I showed up. The guitar was gone. Back home, I looked over the guitar more closely. Not only was it missing strings, it was missing three of the six tuners. It had a big crack running down the side. It was made of plywood. Other than that, it was fantastic! And, best of all, it was MINE! About a mile from home was a music store. It was a mom and pop operation that sold used instruments. I used to go there just to drool over the guitars. Now I had one of my own. I carried it up to the store and showed it to the owner to see if he had the parts I needed. He did! I bought three old tuners and he gave me used strings. I was in business. That afternoon, I installed the tuners and put on the strings. I put duct tape over the crack on the side. Now all I had to do was figure out how to play it. I’m lucky. Music comes very easily to me. My sisters all got piano lessons. After they’d practice, I’d come downstairs and figure out what they were playing. I couldn’t read music and I didn’t get lessons. It’s just something I’ve always been able to do, like being double-jointed. I sat at the piano with my guitar and kind of figured out where the notes were and how to play some chords. I still remember the first song I taught myself; “The Wreck Of The Edmund Fitzgerald”. I played that guitar nonstop. I didn’t even have picks. I used the caps of Bic pens, until my dad noticed. He came home the next day with a handful of pics he’d bought at a music store in the city. That meant a lot. So that’s the story of my first guitar. I’ve since had, and continue to have, many others, but, of course, that old beat up guitar still stands out in my memory.